Reading and share top 27 famous quotes and sayings about Open Hearts by famous authors and people. Browse top 27 famous quotes and sayings about Open Hearts by most favorite authors. 1. "Kindness is an open communication between hearts and not required to be learned by searching, teaching, or even preaching." 2. "Same day, 11 o'clock p. m..—Oh, but I am tired! If it were not that I had made my diary a duty I should not open it tonight. We had a lovely walk. Lucy, after a while, was in gay spirits, owing, I think, to some dear cows who came nosing towards us in a field close to the lighthouse, and frightened the wits out of us. I believe we forgot everything, except of course, personal fear, and it seemed to wipe the slate clean and give us a fresh start. We had a capital `severe tea' at Robin Hood's Bay in a sweet little oldfashioned inn, with a bow window right over the seaweedcovered rocks of the strand. I believe we should have shocked the `New Woman' with our appetites. Men are more tolerant, bless them! Then we walked home with some, or rather many, stoppages to rest, and with our hearts full of a constant dread of wild bulls." 3. "To women who please me only by their faces, I am the very devil when I find out they have neither souls nor hearts — when they open to me a perspective of flatness, triviality, and perhaps imbecility, coarseness, and ill-temper: but to the clear eye and eloquent tongue, to the soul made of fire, and the character that bends but does not break — at once supple and stable, tractable and consistent — I am ever tender and true. (Mr Rochester to Jane)"
4. "Our hearts bear a similarity with storerooms. We hold in them our trampled convictions, our fears, suppressed acts of valor, disappointments, enmity, anguish, secrets, things we wish we should have done, things we wish we shouldn't have, regret.And continue piling them up with emotions, memories, conversations which did happen and conversations which didn't, soured relationships and bitter people all of which we should have discarded, we keep it within until there is no space left, until the room is full, occupied after which we go on to lock it. Once in a while we happen to open the room and sight the dust accumulated all over, we relive each moment, each memory and each emotion again and soon fall upon the realization as to how deeply the room is in need of cleaning and so we clean it.We clean it so that we can fill it once more, hold it, bear it, relish it, heal from it and then finally let it go." 5. "When we find ourselves in a situation in which our buttons are being pushed, we can choose to repress or act out, or we can choose to practice. If we can start to do the exchange, breathing in with the intention of keeping our hearts open to the embarrassment or fear or anger that we feel, then to our surprise we find that we are also open to what the other person is feeling. Open heart is open heart." 6. "That so many thousands of children around the world are available for adoption is a sign of our impoverished humanity. That so many persons around the world open their hearts and homes each year to embrace a few of these children is a lasting testimony to humanity's enduring nobility." 7. "Our Father, who has set a restlessness in our hearts and made us all seekers after that which we can never fully find, forbid us to be satisfied with what we make of life. Draw us from base content and set our eyes on far-off goals. Keep us at tasks too hard for us that we may be driven to Thee for strength. Deliver us from fretfulness and self-pitying; make us sure of the good we cannot see and of the hidden good in the world. Open our eyes to simple beauty all around us and our hearts to the loveliness men hide from us because we do not try to understand them. Save us from ourselves and show us a vision of a world made new." 8. "To me, animals have all the traits indicative of soul. For soul is not something we can see or measure...No one can prove that animals have souls. Asking for proof would be like demanding proof that I love my wife and children, or wanting me to prove that Handel's Messiah is a glorious masterpiece of music. Some truths simply cannot be demonstrated. But if we open our hearts to other creatures and allow ourselves to sympathize with their joys and struggles, we will find they have the power to touch and transform us. There is an inwardness in other creatures that awakens what is innermost in ourselves." 9. "While parents possess the original key to their offspring's experience, teachers have a spare key. They, too, can open or close the minds and hearts of children." 10. "The inside is packed with people. Lots of them crowding the bar, passing drinks back for people to carry to tables. A bunch of guys are pouring shots of vodka. "To Zacharov!" one toasts. 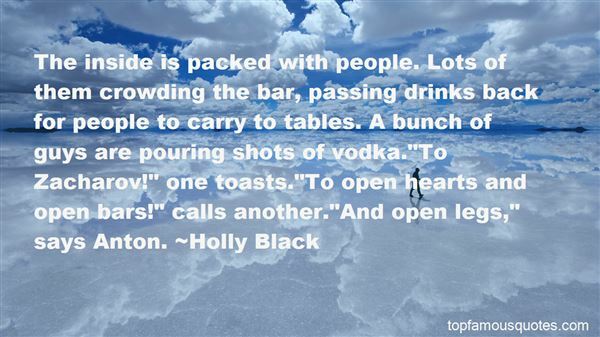 "To open hearts and open bars!" calls another. "And open legs," says Anton." 11. 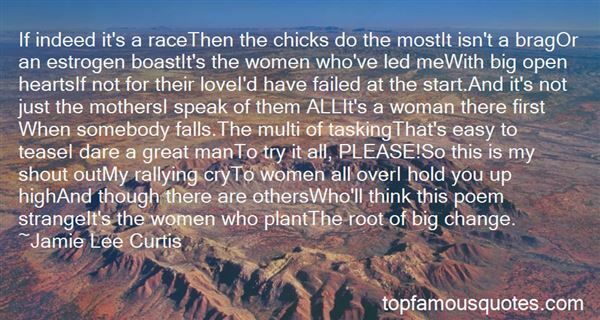 "If indeed it's a raceThen the chicks do the mostIt isn't a bragOr an estrogen boastIt's the women who've led meWith big open heartsIf not for their loveI'd have failed at the start.And it's not just the mothersI speak of them ALLIt's a woman there first When somebody falls.The multi of taskingThat's easy to teaseI dare a great manTo try it all, PLEASE!So this is my shout outMy rallying cryTo women all overI hold you up highAnd though there are othersWho'll think this poem strangeIt's the women who plantThe root of big change." 12. "[A]fter all, the position of a reader in a book is very like that occupied by angels in the world, when angels still had any credibility. Yours is, like theirs, a hovering, gravely attentive presence, observing everything, from whom nothing is concealed, for angels are very bright mirrors. Hearts and minds are as open as the landscape to their view, as to yours; like them you are in the fabled world invisible." 13. "Working overseas is more difficult in that it's much more complicated to get people to open their hearts to you and to tell you information." 14. "We accept responsibility for ourselves when we acknowledge that ultimately there are no answers outside of ourselves, and no gurus, no teachers, and no philisophies that can solve the problems of our lives. They can only suggest, guide, and inspire. It is our dedication to living with open hearts and our commitment to the day-to-day details of our lives that will transform us." 15. "(If God wills it)... the number of angels... may be infinite... Blessed are they that have not seen and yet have believed. Once upon a time, atoms did not exist. There was no Dalton, no Rutherford. Albert Einstein was nothing more than a theorist, but you only have to look at Hiroshima and Nagasaki to know that things invisible exist and bear great power. The power to destroy. Or the power to create... 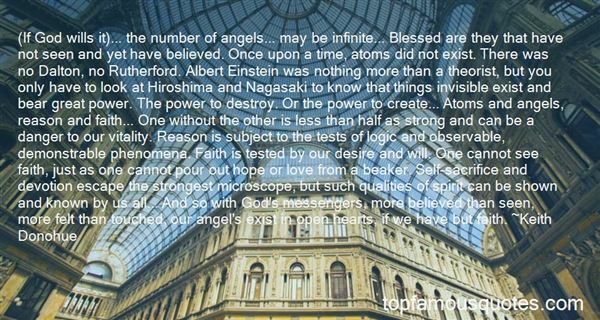 Atoms and angels, reason and faith... One without the other is less than half as strong and can be a danger to our vitality. Reason is subject to the tests of logic and observable, demonstrable phenomena. Faith is tested by our desire and will. One cannot see faith, just as one cannot pour out hope or love from a beaker. Self-sacrifice and devotion escape the strongest microscope, but such qualities of spirit can be shown and known by us all... And so with God's messengers, more believed than seen, more felt than touched, our angel's exist in open hearts, if we have but faith." 16. "Where's your fiancé?" Trevor asks casually. I stiffen slightly, and Trevor steps back a little. "Well," I breathe. "Um, we sort of broke up. "Trevor's eyes widen a fraction, an eyebrow raising in surprise. He stops dancing, but none of the other couples seem to notice, too caught up in being in love. "Why?" Trevor whispers, still holding my hand, his arm still around me.My hearts thumps harder, slower, each beat waiting for my answer as I stare into Trevor's eyes. I open my mouth to give some answer, some casual it-didn't-work-out kind of thing. But instead, I hear myself say something else entirely. "Because he wasn't you." 17. "Nothing breaks the heart more than the betrayal of those we trust most. But we cannot permit such pain to consume us. Others' actions and decisions cannot break us unless we allow it, which we must never do. We must forgive and we must heal. we must learn to open our hearts and love again. Otherwise, our souls will become as dark as theirs." 18. "South Africa is blessed to have women and men like yourselves who have little to give but give what you have with open hands and open hearts." 19. "There are times, he would tell the Reshtar, when we are in the midst of life--moments of confrontation with birth or death, or moments of beauty when nature or love is fully revealed, or moments of terrible loneliness--times when a holy and awesome awareness comes upon us. It may come from beyond us, without any provocation, or from within us, evoked by music or by a sleeping child. If we open our hearts at such moments, creation reveals itself to us in all its unity and fullness. And when we return from such a moment of awareness, our hearts long to find some way to capture it in words forever, so that we can remain faithful to its higher truth. He would tell the Reshtar: When my people search for a name to give to the truth we feel at those moments, we call it God, and when we caputure that understanding in timeless poetry, we call it praying." 20. "He talks about God, and loving God. he says that when we open to loving a person, whether that person is a spouse, friend, or child, we open our hearts to loving God. He says when we let someone love us, we're opening our hearts to god's love. he says the acts are the same. p 19I decide loving isn't for the fain. Its for the courageous. p 19"
21. "There are accounts that, if we open our hearts to them, will cut us too deeply." 22. "The genius of America is that we are still a land of undiscovered shores, and we are at our best when we open our hearts and allow the night winds to bring renewed visions of great deeds." 23. "I leave pansies, the symbolic flower of freethought, in memory of the Great Agnostic, Robert Ingersoll, who stood for equality, education, progress, free ideas and free lives, against the superstition and bigotry of religious dogma. We need men like him today more than ever. His writing still inspires us and challenges the 'better angels' of our nature, when people open their hearts and minds to his simple, honest humanity. Thank goodness he was here." 24. "The purpose of any ceremony is to build stronger relationship or bridge the distance between our cosmos and us. The research that we do as Indigenous people is a ceremony that allows us a raised level of consciousness and insight into our world. Through going forward together with open minds and good hearts we have uncovered the nature of this ceremony"
25. "Love is an art, Berk. Just like painting or music. Some painters draw mere lines, scratches on the canvas and call them art; some paint stars studded skies like van Gogh; or Chopin's music conquers the hearts of millions while the execrable disco music blaring out of the open windows of a car have also their audience. Some describe love in high-flown flowery language and you identify yourself with the hero and the heroine and feel yourself in the seventh heaven while some give such a lamentable picture of it that you almost curse it!" 26. "Naturally all of them had a sad story: too much notice, not enough, or the worst kind. Some tale about dragon daddies and false-hearted men, or mean mamas and friends who did them wrong. Each story has a monster in it who made them tough instead of brave, so they open their legs rather than their hearts where that folded child is tucked." 27. "I discipline churchgoers with godly lessons and sharp words if they do not change their ways. My goal is to open their hearts so that they seek forgiveness." What we're doing is fun - if you have any sense of humor at all!"